The answer is pretty simple but at the same time troubling enough to warrant an explanation. I needed some adventure, I needed to put my money where my mouth is AND I wanted my teen daughter to taste history as it is happening. I accomplished all of these in one swoop. My daughter and I joined an effort sponsored by Charm City Farms – a school bus trip to Standing Rock Camp in North Dakota with roughly 16 strangers from Baltimore. 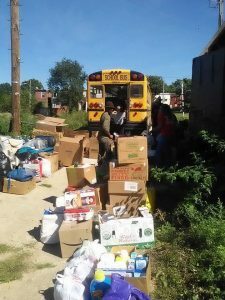 The primary goal of the project was to deliver donated goods from the Maryland area like food, clothing and camping gear. 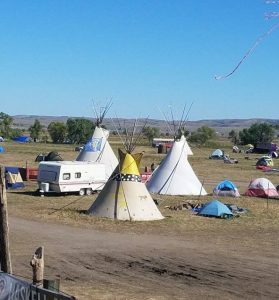 What is Standing Rock Camp? What does Standing Rock Camp have to do with history? And why did we feel the need to donate basic living supplies? This is where the troubling part comes in, so allow me to use a spaghetti western as an analogy. Standing Rock Camp dovetails into an obscured arc of history between the United States and Native Americans. Standing Rock Camp is adjacent to one of the tiny swaths of Treaty Land still retained by Native Americans. In this specific scenario, the Standing Rock Sioux Tribe are The Good. Next on scene is The Bad – Energy Transfer Partners (headed by Kelsey Warren) who is building the Dakota Access Pipeline (DAPL). Then, hovering with a sense of omnipotence- The Ugly, also known as The United States Government in varying offices, authorities, and power. More specifically The Army Corp of Engineers, President Obama and the Department of Justice. What could possibly draw such a soup of interests to one tiny place on the prairie in midwest USA? Why oil of course. Does the Standing Rock Sioux want to take possession of the oil coursing through their land to make fortunes for themselves? NO. The epoch-marking unified nation of 500 tribes are compelled by their ancestral living culture to stand their ground as Water Protectors for everyone and all beings. The Water Protectors are devastated they weren’t involved in decisions about the path of the DAPL. The Standing Rock Sioux has litigation pending that describes sacred sites in the construction path. After disclosure of these sites in court papers, DAPL construction workers bulldozed and dug up the specified sacred sites ( in layman’s terms that means cemeteries). Litigation by the Standing Rock Sioux also points out the original pipeline path was denied by the nearby citizens of Bismarck, North Dakota who were consulted. Also, it is unconscionable to Water Protectors that the pipeline is slated to bore under the Missouri River. Eventually, the pipeline (recent history validates this assumption) will poison the waterway which is the ONLY water source for the nearby Native Land as well as millions of Americans downstream. Very little has been covered on national news about this prayer camp and the aims of the Water Protectors. What has made its way into social media and to the public eyes of the world is the astonishing brutality against the Water Protectors by Energy Transfer Partners hired militia, Morton County Sheriffs Department, the Bureau of Indian Affairs AND the National Guard. Brutality against Water Protectors who repeatedly remind visitors that weapons are not allowed under any circumstance. The elders continually remind everyone the Water Protectors’ tool is prayer and solidarity of purpose. The crucial information I want to give you from our trip to Standing Rock is the Water Protectors aren’t a discordant, gang of protestors trying to create anarchy. The Water Protectors we met were families with children. 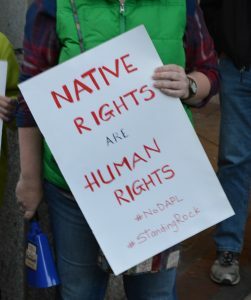 In fact – a baby was recently born at Standing Rock. They are people from every conceivable walk of life. There are Veterans, there are artists, there are construction workers, teacher, nurses, solar energy business owners, Tribal leaders, teenagers, horse people. Leaders from the fight against oil in the Amazon are there, as are people from Hawaii, from Sweden, from Palestine, from 500 tribes around the Americas. People have traveled from ALL over the world to show their solidarity and support with the Water Protectors because water is threatened all over the globe and indigenous people are often the people who suffer the ill effects first. As for our small busload of Baltimorean’s – all we felt was welcome. All of the people we spoke to appreciated our effort to be there and to bring them much needed supplies. The kids jubilantly helped us unload the school bus. It was such a refreshing feeling to be embraced by a unified sense of purpose. The energy at Standing Rock Camp is the antithesis of the feeling in the United States post-election. We spent our time after unloading, walking through both the main camp and the smaller Red Warrior Camp. The landscape is utterly different from Baltimore. Curving hills and great stretches of water hidden between crests. On the horizon, we could see the many tepees and tents and vehicles of the Water Protectors — watched over by the fluttering flags of all the present tribes. We heard occasional snorts and neighing of nearby horses. Kids laughing. Lots of conversation rising and falling on the air currents. We stopped at the Action Art Tent where the hand signs and screen printing and a giant banner were being produced. My daughter, who loves visual art, jumped right in to help paint the giant banner which simply said, “WATER IS LIFE”. Law enforcement confiscated the banner a few days after we left. We sat in the big communal space as lunch was offered and ate with people who had also arrived that day. We listened to the many announcements and concerns voiced over the communal microphone. EVEN without cell phone access my 14-year-old daughter did NOT want to leave. She tried to sleuth a way we could stay just a little longer, maybe overnight. But we were trapped by previous commitments. We felt physically torn. We were so grateful for the experience and the rare beautiful energy of the undertaking that is Standing Rock Camp. But we climbed back into the school bus and came home. Thousands of Water Protectors are hunkering down in the camp through the brutal North Dakota winter. They are not leaving until the DAPL is stopped. They are committed to this completely. The Water Protectors are surrendering their comfort, their own money and, in some cases, their jobs, to protect the water for all of us. The politics, the emotion, the bravery, the commitment and the unnecessary violence from “law enforcement” are explained, referenced, documented, filmed, photographed and otherwise shared on many digital sources and can convey much better than I can how special and necessary the peaceful action is that unfolds at Standing Rock. I’ve included some links below for you to peruse and share. Julie Fisher has been known to write, create community events with an arts focus, jump into projects head first and learn while doing, grow food haphazardly, dabble in teaching children, parents 3 people, partners in KnotYouVintage and will surely unveil some quasi-planned, idealistic project in the near future. Contact the author.